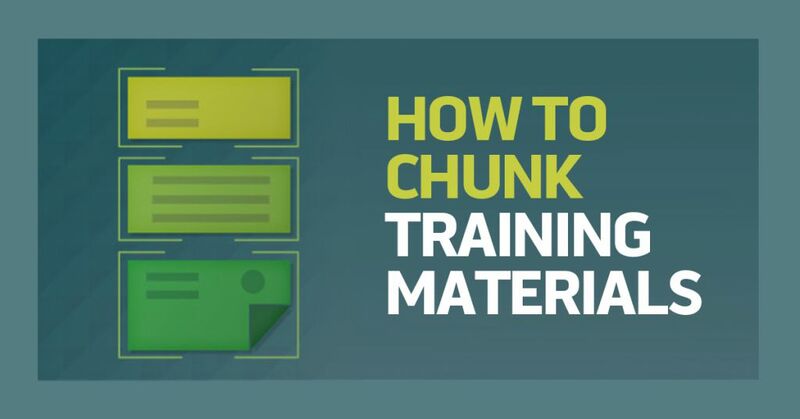 If you want to know how to create more effective training materials, you need to know how to chunk training materials. And YES, chunking is the accepted term in the field, even if it does sound a bit strange. Chunking is the process of breaking down instructional materials into smaller, “bite-sized” pieces and then arranging them in a sequence that makes it easier for your learners to learn the material. But, before we do all that, we’re going to take a step back and explain why you should care about this. Convergence Training are workforce training experts. Click the links below to learn how we can help improve performance at your workplace. So why should you care about chunking? Because when you’re creating training materials, your goal should be to create training materials based on an informed understanding of how people learn. And as you’ll see below, presenting materials in chunks takes advantage of some unique aspects of how people learn. We’re going to keep this explanation short (you can read a longer version here), but learning involves taking sensory input from the outside world and moving it through three different structures of our memory system. Let’s look at the whole process. Sensory Input from the Outside World: This is everything going on around you while training is occurring. It includes the actual training materials but lots of other things too–the room temperature, the chirping birds outside the window, etc. Sensory Memory: Information from the outside world floods your sensory memory, but it lasts for only a brief period of time and most doesn’t gain your conscious attention. Working Memory: A fraction of the information from your sensory memory advances to your working memory. This is information that you are aware of and that your brain is actively “working on.” The hitch is that your working memory can work on only a small number of things at one time (around four) and it can hold information for only a short period of time (about ten seconds). Long-Term Memory: Some, but not all, of the information from your working memory will then be transferred to your long-term memory. This process is called encoding. It seems that the long-term memory is essentially limitless-there are no limits to the number of things it can store or how long it can store them. Information in the long-term memory is “packed away” in structures called schemas. Once information is in the long-term memory, it can later be retrieved when needed. At that point, it returns from the long-term memory to the working memory. So working memory is the “bottleneck” in our learning process. It can’t hold a lot of information, and it can only hold that information for a short period of time. It’s easy to overwhelm the working memory–give it too much information, and the working memory simply loses some of it. It’s just gone. This is known as cognitive overload. And if you overwhelm the working memory, that information has no chance to make it into the long-term memory and later be retrieved and used. And that, my friend, is where chunking comes in. We chunk training material because we know how the human brain processes information during training and we don’t want to overload the working memory. Chunking is intended to avoid overwhelming the working memory. It also plays a role in helping to encode the schemas in the long-term memory. A simple definition of chunking is that it’s taking information and breaking it down into small little pieces. But it’s also important to remember that you’ll then arrange those little chunks into some organized training sequence for your learner. With that in mind, let’s go over some tips about the size of your chunks and the order you present them in. As you probably know, before you design and create training, you should learn some things about the specific learners the training is intended for. That will let you design training that’s better suited for their learning needs. And one of the most important things you can learn is their existing knowledge in the topic. In particular, it’s important to know if they’re novices on that topic or if they’re well-informed experts on the topic. Why is that so critical? You might think it’s because experts in a topic can handle more chunks of information about that topic than novices can. But that’s not it. Novices and experts have the same working-memory limits-about four chunks. But what IS different, and what SHOULD influence the design of your training, is the size of those chunks. Novices can work with four small chunks. Experts, on the other hand, can work with four larger chunks. Why is that? Why can experts work with larger chunks? It’s because they have existing schemas in their long-term memory that they can use to “absorb” and make sense of the new information. Those schemas “support” the learning process for the expert in the topic. And, as a training developer, part of your job is to provide what’s called “scaffolding” for novice learners who don’t have that built-in support from existing knowledge stored in the long-term memory. There’s a good chance the learning materials you’re creating include more than one activity (or course, or whatever you happen to call it). If so, begin by breaking the entire curriculum into smaller parts. For example, your curriculum might include modules, your modules might include lessons, your lessons might include activities, your activities might include topics, and your topics might include screens (in an elearning context). The important thing isn’t the terms you use for curriculum/module/lesson/activity/screen. What’s important is that they’re broken down and organized in a logical manner. In some cases, the organizational scheme will be linear because you’re creating a linear learning experience for your learner. In other cases, when you’re creating training that’s non-linear, you may organize in a different way–by concept, for example. You may not get this breakdown perfectly the first time. Return and revise it as you learn more. This isn’t a failure, it’s a success of the process. Training is always about evaluation, revision, and continual improvement. In learning, less is more. While you’re still in the design phase, keep an eye out for materials that are unnecessary. And then cut them. It may be difficult to do, but it will create more effective training materials for your learners. Is it unrelated? Is it a “nice to know” or an “interesting fact?” If so, nix it. Ultimately, you’ll begin designing training for one “moment”–in the context of elearning, you’ll be designing your screen. Try to introduce only one idea per screen, and keep it short. Remember what we said earlier about the limits of working memory, and check to make sure you’re not piling on too much. Are they arranged in a logical order? Are you presenting too many chunks before learners get a chance to practice or take a break? Remember, you’ve only got about four chunks to work with. While developing training, you may discover you’ve got to include some fragments that aren’t truly “chunk-sized.” If that’s the case, try to find a way to group them into a chunk so they can be memorized in that way instead of individually. You’ll have to get creative here–maybe you can create a mnemonic device. I know I still lean heavily on ROY G. BIV when I need to remember the colors of the visible spectrum. There may be some logical order that comes somewhat “built-in” with the topic. For example, if the training is about the spread of a terrible disease throughout the globe, the training may be structured by geographic region, such as by continent. Or, you might present training about the history of jazz in chronological order, from its New Orleans roots to big band swing, be-bop, free and “out” jazz, and contemporary jazz. I put inherent structure at the top of this list because one could argue that several of the following items are subsets of inherent structure. If you’re training someone to perform a job task, it may make sense to order the training in the same order as the learner will perform the task at work. A lot of training for job procedures fits the bill here, as does process training (for example, how a complex machine works). In many cases, learning will be a step-by-step process in which you learn a prerequisite then learn material that depends on knowing the prerequisite. Want to teach someone to troubleshoot a complex system? It’s probably best to begin with training that explains how the system works. Start with a big-picture/birds-eye view, then “drill down” into the smaller parts. I do this a lot when I work with new customers who are implementing one of the Convergence Training learning management systems. First I give an overview of the system, then we learn how they’ll use the various parts to enter their workers, import and create training materials, make assignments, and so on. This can be useful during lengthy trainings–it’s probably better for a “curriculum” than a single “activity.” The idea is early in the training, you introduce a concept. Then, as the training progresses from module to module, you continue returning to that concept, learning about it in deeper, richer, more intricate ways. This article on spaced practice and this interview with Dr. Will Thalheimer on spaced practice go into this more deeply. This can be useful if there’s no real inherent structure of your training materials. For example, the Convergence Training Knowledge Base, where our existing customers can go to learn more about our learning management systems, is organized in a “flat” list of categories–Personnel, Training Materials, Assignments, Crediting Training, Reports, and so on. This is commonly used in glossaries, software helpful files, and similar contexts, though it’s probably not as great for job training. It’s easy for your learners to quickly understand this organizational scheme and begin selecting the information they need. Depending on your content, putting materials with the most important stuff first, the most important stuff last, or the most important stuff first AND last may suite your needs. This is especially useful if the training topic has no inherent structure. There are other ways to do this, too. For example, at Connie Malamed’s blog post on this topic, one of her readers recommended “spatial” and gave an example of anatomy training. Feel free to list your ideas in the comments section below. Don’t forget to think of presenting chunks of information over time as well, with an original, primary training followed up with shorter, refresher training sessions. For more on this, I’ll once again recommend this article on spaced practice and this interview with Dr. Will Thalheimer on spaced practice. Finally, feel free to download the free guide below! All the basics about writing learning objectives for training materials. We consulted the following resources–plus learned from others in the more distant past–while researching this article. Thanks and credit to them all. I’ve read about this many places, but I especially like the way it’s covered in the first parts of Connie Malamed’s book Visual Language for Designers. Again, I’ve read about this in many sources, but a favorite is Julie Dirksen’s book Design for How People Learn. Connie Malamed’s blog article 10 Relevant Facts About the Brain gives 10 quick tips on these lines too-with a bit of a focus on how the brain works. The original theory of “chunking’ and the limited capacity of the working memory was created by George Miller in an article titled The Magic Number Seven, Plus or Minus Two. Note that seven has since been reduced to about four. Great overview of chunking…I’ve been touting this for years. In my experience some have difficulty with a general to specific design, preferring a bottom up approach. This is especially true in technical fields and can take longer than necessary. Your examples for organization are very helpful. Amy, when you say “a buttom-up approach,” what do you mean? Is it the opposite of general to specific–so, specific or to general? Or how would you explain that? Great article! As an accidental ID, I’ve been doing chunking inherently without knowing there was a term for it. It’s an organic way to organize and present material. Thanks for the information and validation that my ‘gut’ was spot-on! Kathe, the list of “accidental IDs” is a long one, and that’s how I began as well. And that’s one of the reasons we write a lot of articles on “basic” topics like this. Good for you for chunking without knowing a name for it, and enjoy the very scientific name now that you know it. You were wise to trust your gut. Have a great day. Thanks for the great article Jeffrey! Will save this info. Could be helpful when building a knowledge base in my company. “How to Chunk Training Materials……..
You need to be more concrete and specific than saying “in a logical manner”. For complex procedure, only via input/output analysis is one actually guided through such “drilldown”. This input/output analysis is employed by Data Flow Diagrams. Thanks for the thought and suggestion. I wrote “…in an organized fashion…” because I don’t think there’s always one “organized way” to present the information. In some cases, there may be just one organized way, but maybe it’s different than the organized way used for a different training. Or, there may be multiple different organized ways to choose from. What I think is important is that you present it in some form of appropriately organized manner that makes it easier for your learners to process and then learn from. Some will say no, you shouldn’t organize, you should allow the learner to choose how he/she wants to process the information, including the order. I think that’s an interesting point as well. But I guess even then, you’re creating some organization scheme when you create the user interface. What more can you tell us about this? Glad you found something helpful there!